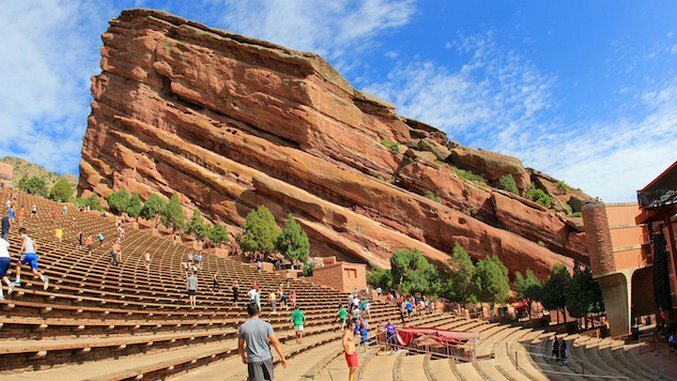 Located 10 miles west of Denver in Morrison, Colorado, where the Rocky Mountains and the Great Plains meet, Red Rocks is the only naturally occurring, acoustically perfect amphitheater in the world. The 868 acres around the theater are saturated with sandstone rocks, prairies and grassy plains that are teaming with wildlife. The rocks around the venue encompass Jurassic period fossils more than 160 million years old. Designed by Burnham Hoyt and opened in 1941, this theatre has a capacity of over 9,000 with sandstone elevated near the seating areas. Artists who have performed at the Red Rocks include U2, Sonny and Cher and Widespread Panic, with the record of the most sold out shows. Situated north of Hollywood and the Highlands in California, audience members can spot the Hollywood sign above the Hollywood Bowl’s bandshell in the hills. Before the bowl was even called the Hollywood Bowl, the newly formed Theatre Arts Alliance sent two of their members to find an outdoor location for productions. Willian Reed and his son H. Ellis came upon the spot known as Daisy Dell that would one day be known as the Hollywood Bowl. The venue that opened in 1922 has a capacity of around 17,500. Louis Armstrong and Ell Fitzgerald performed at the bowl in 1956 as well as the Beatles in 1964 and 1965. Jones Beach Theater is located in Jones Beach State Park in Wantagh, New York. While experiencing a performance, fans lay their eyes on the stage, but also the Atlantic Ocean beyond. Designed by Robert Moses, the venue was opened in 1952 to originally host musicals. When first operational, there were 8,200 seats until an expansion in 1998 when the capacity rose to over 15,000. Jones Beach’s original design included a moat with the stage separate from the beach. The theater underwent renovations that filled the moat and added additional seating that was closer to the stage. Some well-known artists who have performed at Jones Beach include Journey, James Taylor and Chris Brown. This turn-of-the-century bandshell is right smack dab in the middle of Millennium Park in Chicago, Illinois. The bandshell and the BP Pedestrian Bridge over Columbus Drive were designed by Frank Gehry to strengthen the pavilion’s acoustics and lessen the street noises. The theatre is located on a 95,000-square-foot lawn area with a total seating capacity of 11,000, 4,000 fixed and 7,000 on the lawn. Due to legal regulations, the city of Chicago classifies the venue as a piece of art rather than a building. Above the lawn are overhead trellises of crisscrossing arches in a lattice pattern which adds to its futuristic vibe and its state-of-the-art sound system. The sound system mimics the acoustics of an indoor hall and was the first of its kind in the country. Since July 2004, when the pavilion opened, performances have included everything from mainstream rock bands to opera singers and classical musicians. The Gorge Amphitheatre in George, Washington, is a nature enthusiast's dream venue with the stage positioned so the audience is facing the gorge with a picturesque backdrop while they are rocking to their favorite bands. The Gorge is considered one of the most scenic concert locations in the world, according to The Wall Street Journal. Since its opening in 1985, the spacious venue with a capacity of 20,000, has played host to many music festivals including Dave Matthews Band Caravan, Sasquatch! Music Festival and Lollapalooza. Stadiums with massive jumbotrons and uncomfortable, stiff plastic seats don’t always produce the most appealing atmosphere while anticipating your idol’s musical performance. Just in time for music festival season, CheapTickets has singled out five of the most noteworthy outdoor concert venues that have been transformed into works of art or incorporated into their breathtaking surroundings. While watching the performance is everyone’s top priority, the location and design concept of these venues will have fans do more than just tapping their feet to the beat. CheapTickets has already done the nitty gritty work and compiled hotel and travel costs to make it an easy venture to these hot spots. With summer just around the corner, these works of art reveal what a little imagination can accomplish to experience an artistic, musical masterpiece. * All sample airfare rates shown were accurate and available on CheapTickets.com on 4/27/16 for travel from 6/3/16 to 6/5/16 and may not represent current prices because our real-time pricing booking engine is constantly updating prices and availability. Lauren Spiler is a freelance journalist based in Athens, Georgia, but most call her Spiler.